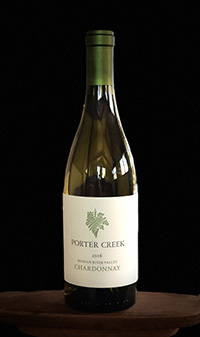 Produced principally from our own hillside parcel and and blended with one very small older vineyard in the in Green Valley neighborhood of the Russian River Valley. Both vineyards are planted with the very small berry clone “Old Wente”, which is known for rich body and aromatic complexity. The cool growing season and lower yields of 2016 further enhance acidity and brightness. The percentage of new French oak barrels is strictly held to a maximum of 30% to keep vineyard character in the forefront.